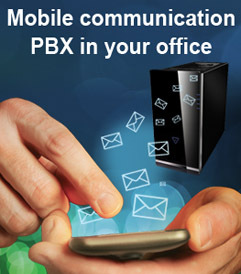 For higher performance you may also connect your PBX directly to the Short Message Service Center (SMSC) of a mobile network operator through the Internet. It is called an SMPP IP SMS connection that can be used to transmit huge amounts of SMS messages. It is a great option to connect your IP system to the GSM network effectively by using your mobile. Turn your smartphone into an SMPP server using Android SMPP SMS Gateway mobile application.